Last week, while I was out in Savannah, I received a phone message from Ben Merens of Wisconsin Public Radio. He invited me to join him on his radio show, "At Issue with Ben Merens", to discuss the lessons we learn from our dogs. Almost exactly two years ago, he and I did a similar show, which was not a rousing success, in my opinion, because of telephone audio problems and my resulting nervousness. So I was a little leery to subject myself to the same ordeal a second time, but I called Ben back and after catching up with one another and chatting about the show's topic, I agreed to join him on the air last Thursday. The show went well. Ben and I started out talking back and forth about the dogs in our lives, what they have meant to us, and what we have learned from them. It may have been because I was on vacation and relaxed, but I wasn't nervous and the conversation flowed smoothly. Ben was nice enough to include some plugs for my book, Raising Charlie: The Lessons of a Perfect Dog, and also for my blog, this blog, "Whispering Jesse". After a break, Ben opened up the conversation to callers, and they shared with us their dog stories. Many were sad, telling of the loss of beloved dogs who had become family members and best friends, but all were joyous, telling of the love and companionship, the lessons learned, and the unparalleled value of having dogs in our lives. I admit to getting choked up over their stories, especially over the poems that callers had written as tributes to their lost dogs. Ben and I could have taken calls for the rest of the afternoon, but our hour together on the air was over quickly. I hope it was as uplifting and therapeutic for Wisconsin Public Radio's listeners as it was for me. 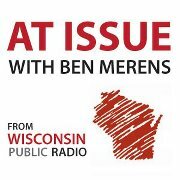 If you would like to listen to the show, it is available in the archives at "At Issue with Ben Merens". Scout will turn four years old tomorrow. Happy birthday, Scout! It had been almost five months since I was out to Savannah to see Whispering Jesse, where she is slipped at Delegal Creek Marina. I arrived last Friday afternoon at my folks' house there on Skidaway Island, and my dad and I went down to check on the boat right away. She had weathered the time alone better than I expected. The padlocks were not rusted shut, and the cabin was not filled with mildew, but there was a substantial amount of seagull poop on the decks and canvas, and there was some mysterious wetness in the forward berth cushions. After poking around and checking everything out, Dad and I spent a few minutes trying to figure out the new portlight screens that I ordered last fall. They fit nicely, but they're difficult to install and they need to be removed in order to close the portlights -- not very convenient unless we're planning to stay in the same place for an extended period. The only really alarming issue Dad and I noticed was the large quantity of dirty water in the bilge. I had not plugged the boat into shore power when I left her because I was afraid of a possible electrical short or fire, but apparently the automatic bilge pump ran down the battery and stopped working some time ago. The battery-powered lights still worked, so I wasn't sure right away what the problem was. But on Saturday morning, as soon as I plugged into shore power, the bilge pump kicked in and emptied out the bilge in short order, leaving behind a brown scum. I picked up some concentrated bilge cleaner at the local West Marine store, and it seemed to make a little difference. It may take multiple treatments to get the bilge back to some semblance of clean. I did the best I could scrubbing off the seagull poop, but like the bilge scum, it will take multiple treatments. 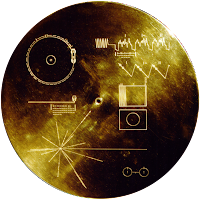 After cleaning the decks, I held my breath and turned the key in the engine's ignition. It started right up. I checked the water intake strainer and checked that water was coming out with the exhaust. All seemed good. I let the engine run for about ten minutes while watching the gauges. Everything looked good. I was pretty confident that the boat would be ready for Dad and me to motor her up to Thunderbolt Marine on Monday morning to get some work done. There were some rigging issues left over from last year's refit that needed to be corrected, and the new diesel engine needed its fifty-hour maintenance. After filling up at the fuel dock, we motored out of Delegal Creek shortly after nine o'clock. About a half-mile out, with the engine running at about two thousand RPMs, I noticed an alarming amount of exhaust smoke blowing out at water level. The temperature gauge was climbing. I reduced the RPMs to idle level and went below to check the water intake. There was hardly any water flowing through the strainer. The through-hull must have been clogged by the growth that had also developed on the hull during its five months in the water. I wondered if I could unclog it with something on board, but the hose makes an S-curve between the strainer and the through-hull, so it would take a drain snake or something similar, which I didn't have. The engine alarm started its piercing cry. There was a significant counter-current and headwind, so I didn't want to turn off the engine or we would find ourselves going backwards. The reduced RPMs allowed the engine to cool enough for the alarm to shut off, and we decided to keep it running until we could make the right turn into Ossabaw Sound at the last Delegal Creek channel marker. At less than one knot of forward headway, it took forever to get out there. We turned off the engine to let it cool and drifted with the wind and current. Dad was at the helm, and he couldn't get the boat to steer toward the channel markers without any useful headway. The water was too shallow to allow for sailing, or we would have put out a foresail. We would eventually run aground if we continued to drift, so I pulled out my cell phone and called BoatU.S. to arrange a tow. The service works like AAA does for automobiles, and I was awfully glad I had it. The customer service person asked for our boat information and GPS coordinates, and she said a tow boat would be out to meet us within the hour. A few minutes later, Dana from Thunderbolt Marine, the same place where we were headed, called to confirm the tow. To control our drift, I restarted the engine and kept it at idle speed. We motored along at one knot for over an hour until we saw the red tow boat coming in the distance and received a hailing call on the VHF radio from Capt. Mike. He pulled alongside and tossed a tow rope. I tied it off at the bow, cut the engine and fell in behind for the long tow up to Thunderbolt. 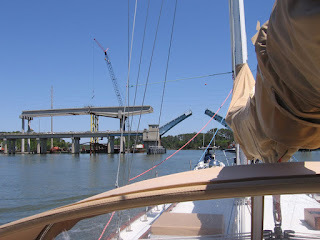 We soon passed under the Diamond Causeway bascule bridge at Skidaway Narrows. It is in the process of being replaced by a high, permanent bridge that will better handle the frequent sailboat traffic along this stretch of the Intracoastal Waterway. You can see the construction progress in the photo above, along with our view of Capt. Mike's tow boat. Instead of arriving at Thunderbolt Marine at noon, as I had predicted, we showed up there at three o'clock. At the entrance to Thunderbolt's harbor, we were able to start the engine, drop the tow line and motor very slowly to the dock, where Mom was waiting patiently for us. Another adventure, more lessons learned. In addition to the rigging and engine work, I asked Thunderbolt to haul and pressure wash the boat and to clean all the through-hulls. With any luck, our return trip to Delegal Creek Marina next Monday will be less eventful. On Sunday morning, my friend John Sasso, my dog Scout and I hiked the Rough Canyon trail south of town, in the Bangs Canyon area off Little Park Road. Scout and I tried to do the same hike last summer, but we were forced to turn around due to wet conditions and some difficult scrambling that I felt was beyond Scout's safety level. We didn't experience the same trouble this time. After our mild winter and extremely dry spring, the going was much easier. 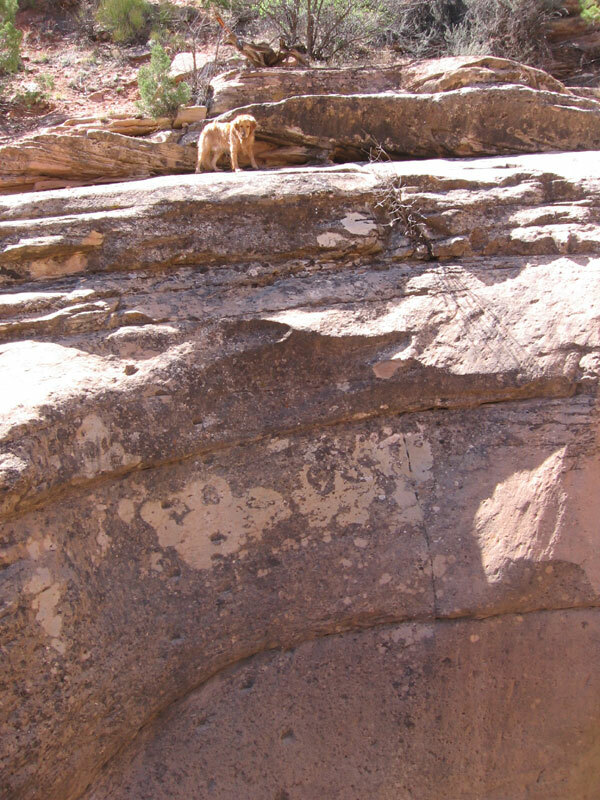 I showed John the petroglyphs that Scout and I had found on a canyon wall the last time, and I was angered to see even more graffiti had been added, some of it practically on top of the ancient rock art. 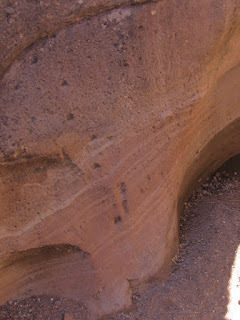 John had done a number of rock climbs in the canyon, and he pointed them out as we worked our way down the canyon's stream bed. Scout made a number of athletic moves through the scrambling sections and rewarded himself with quick swims in the many muddy pools. We eventually reached Rough Canyon Falls, where Scout and I had searched for the elusive moqui steps (sometimes spelled moki steps) during a hike last summer that brought us to the falls from the rim trail that runs above and parallel to the Rough Canyon trail. I told John about the moqui steps during our hike and said that I was hoping to find them that day. He walked up to the edge of the cliff next to the dry stone groove of the falls, pointed down and said, "They're right there!" I joined him and couldn't believe it. I had looked at that same wall the year before and seen nothing unusual, but John saw them right away. I must have been expecting something different the last time, because there was no mistaking them this time. I climbed around the two huge cottonwood trunks that are wedged into the falls to get a better angle for some photos. John looked for a way to get down to the bottom where the steps started, but the only way was to use the steps, which was too dangerous to try without the pool below having enough water to break a fall. Being an avid rock climber, John proposed that we come back another time with a climbing rope and set an anchor using one of the juniper trees on the rim. We could take turns rappelling down to the bottom and then safely climbing the moqui steps back up while on a belay. After giving it some thought, I would guess that the ancient people who carved the moqui steps must have had a hand-woven rope that they used in conjunction with the steps to make it easier to get up and down, especially if they were carrying water containers. The fact that the first step was about four feet above the bottom made me think that the steps were intended to be used when the pool was full of water. During a dry spell, the shaded pool may have been the only local source for fresh water.